As autumn rain fell washing away the despairing soil, the earth gradually revealed in shame the shocking secret it bore within– the evidence of a monstrous crime. During the summer of 1988, following a religious decree (fatwa) issued by Khomeini, the then-supreme leader of mullahs’ regime in Iran, over 30,000 political prisoners were murdered in a two-month nationwide execution spree. The decree immediately sent anyone in prisons who would be considered an “enemy of Islam” to the gallows. No court hearing. No defense. And, no mercy. The victims’ bodies were never delivered to the families. Instead, they were buried secretly overnight in mass graves at remote burial sites. In the years following the massacre, seeing weeping mothers quietly digging through rubbles and mud, searching for their lost loved ones in places rumored to be a secret burial site was commonplace. From time to time, nature washed away the earth and bodies surfaced all decayed up and unrecognizable. But in a most disturbing way, this brought some sort of comfort to the families just thinking there may be a minute chance that they had finally found the place where their children were put to rest. All in all, most families have now come to terms with the fact that they may never know what really happened to their children or their bodies. A cemetery worker witnessing the nightly burials told the families once how at one of the burial sites, Khavaran, the bodies were transferred in large numbers with meat trucks and buried in mass graves with bulldozers overnight. The victims were mostly supporters of the People’s Mojahedin Organization of Iran. Today, Iranian people and their legitimate resistance movement are seeking to establish a peaceful and just society by holding accountable all the perpetrators in charge of the massacre. The “parents of Khavaran,” who are illustrated in pictures with the white pigeons of peace, have always dreamed of freedom and peace. But, without justice talking about freedom and peace is absurd. Those who sacrificed their lives for Iran’s freedom knew that one day, the history will remember them and realize their fair cause. And, that day has come. The parent of Khavaran demand answers. Walking through burial sites, one cannot help noticing batches of red flowers resting on bare ground here and there. It is soothing to the families just imaging that their son or daughter is resting somewhere close by. Searching in Khavaran burial ground pushing the dirt away with her toes, a woman finds an old pot. “It may be sign,” she thinks. Maybe her son is somewhere nearby. So, she turns the pot upside-down and lays a red carnation on top of it. The “Red Carnation of Khavaran” is dedicated to the martyrs of the massacre of 1988, and their families. 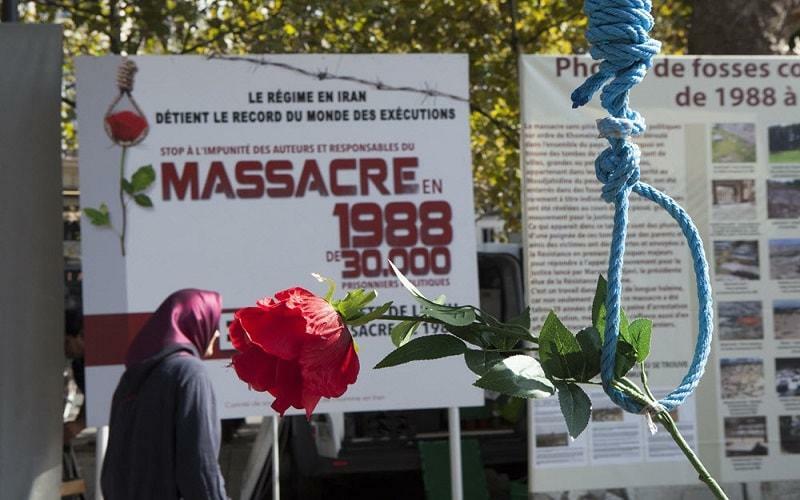 By supporting the movement for justice for the victims of the 1988 massacre in Iran, we will participate in building a free world for the next generation.